Start with a large t-shirt your hubby doesn’t wear anymore. It helps if you love the color. Make sure the shirt doesn’t have any side seams. 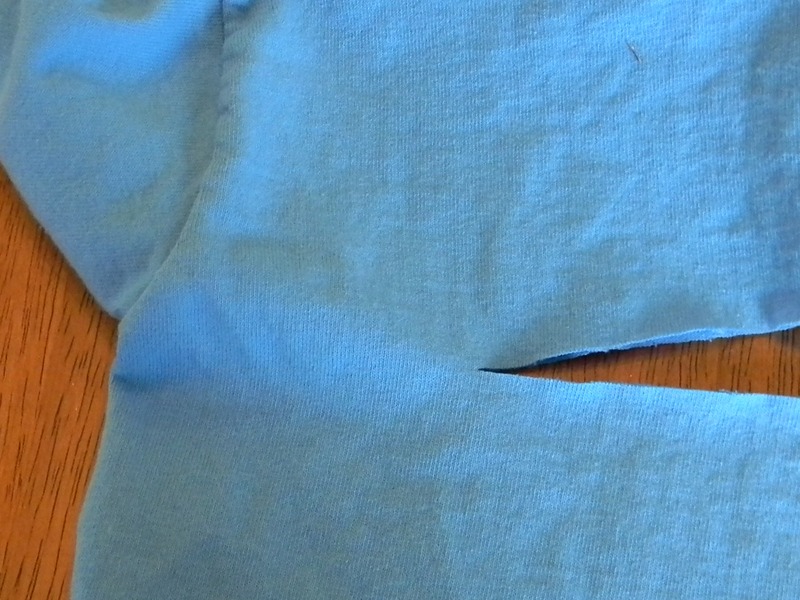 Cut the hem off the bottom of the shirt. Then cut across the shirt, under the sleeves. And you end up with a large loop of t-shirt material. Don’t worry about the cuts being perfectly straight. The edges aren’t going to show. 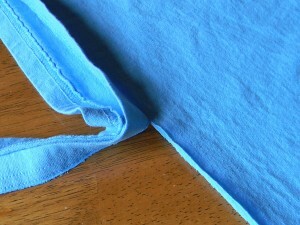 Now you need to stretch the material as much as you can. And since no one else was home, I looped it over a door knob and pulled. I turned it to make sure it was stretched evenly. 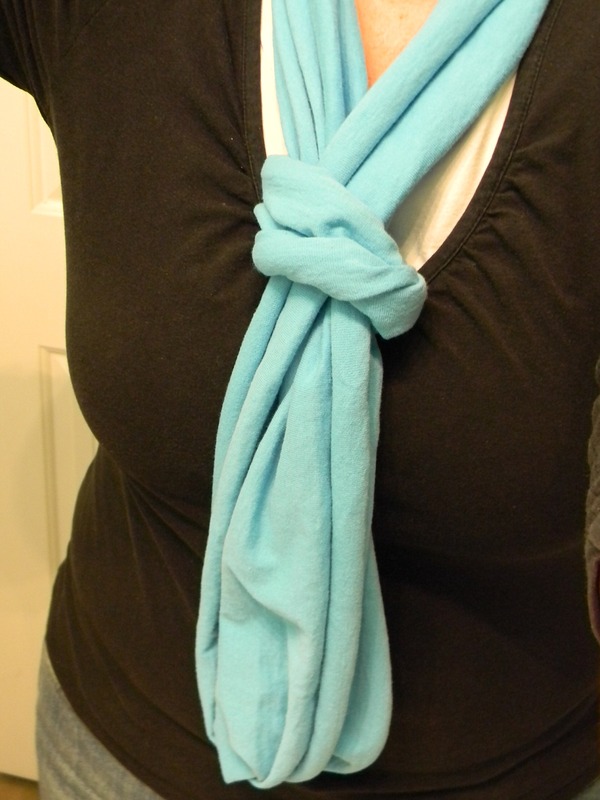 So here’s some ways you can wear your new scarf. Oops! I forgot to show the most obvious one, which is just hanging in one big loop. This is a double loop. One loop and a half knot. A double loop and twisted. One loop and a low knot. One loop and twisted around. I just played with it. This is my favorite. I wore it this way today. It’s a little hard to describe, but I’ll try. Fold it in half and bring it around your neck, put your left hand through the left loop and grab the right loop, bring it through the left loop, then put your head through the loop and arrange the scarf. Did that make sense? Just play with it. I’m sure you’ll get it. So apparently this is what I do when I’m trying to dodge doing things I should be, like painting the kitchen and living room, hanging 2 long shelves, making new pillows, and making cards for card club. I think I’m going to be swamped tomorrow. I LOVE this post. I also love your last paragraph because that sounds just like something I would do. There’s always something more fun to do then what you ‘should’ be doing. 🙂 I might just have to try this, adding it to my Tutorials TO DO list. Love the scarf, the ways you are wearing it are wonderful!! Thanks for sharing. No sewing? This project is not at the top of my list. LOVE IT!!! And I even have some shirts pulls out already that would work. Thank you. Love this!! Have you tried the same thing with skinny strips to make a necklace? Same idea, just each one is a different length! 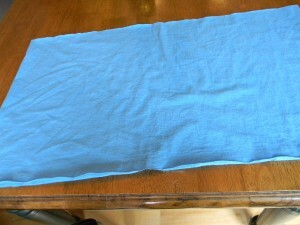 Stop by Pandora’s Box for a chance to win some vintage linens! 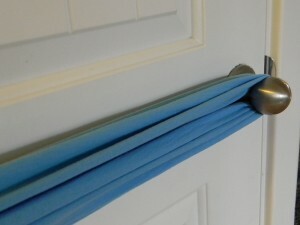 Love this, so easy to do yet a fabbo accessory. LOVE, LOVE, LOVE this! I can’t believe this is a t-shirt!!! I love this idea! Now only if my husband would hurry up and wear out his Moosejaw t-shirt. 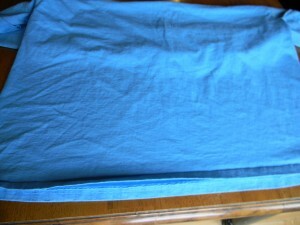 It’s the perfect color and the softest t-shirt ever for my new scarf -lol! um Love this idea! I’m a follower! 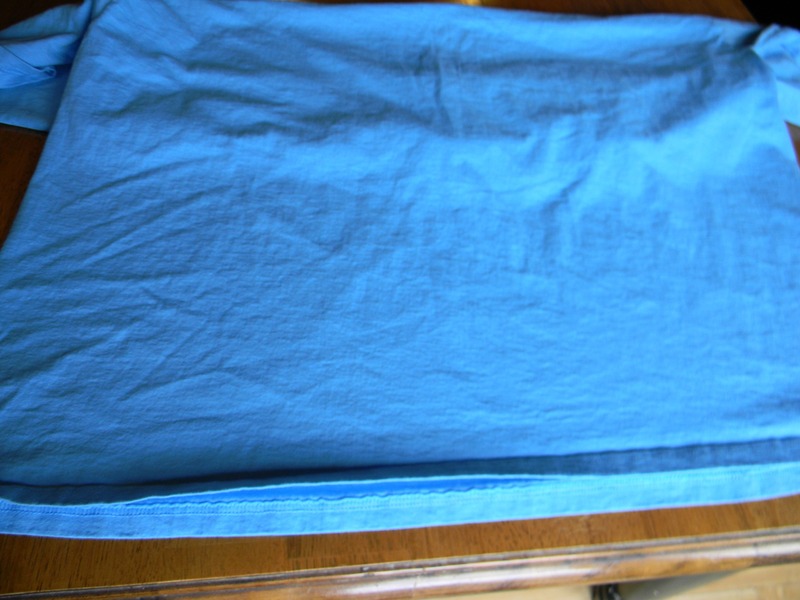 Hey i have a cute skirt for a giveaway for my blog I would love if you stopped by! Very cute indeed! I love it. Now, how to cut up my husband’s shirts without him knowing. Snicker. This is so resourceful. 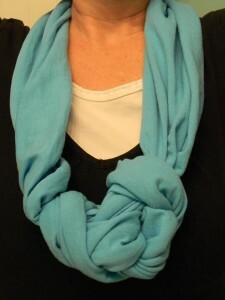 The scarf looks wonderful, perfect springtime weight. Love your scarf and all the creative ways you have to wear it. The ladies in our craft group are always looking for easy and fun ideas. So great! I love the sentiment, and it’s a super cute fashion accessory as well 🙂 Brilliant!! This is such an awesome idea! I love it. 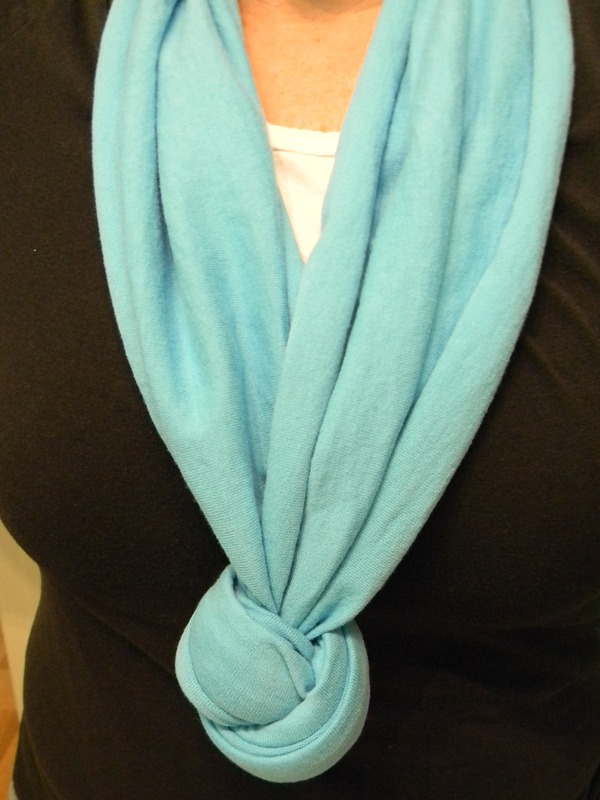 So simple, but great way to spice up an otherwise drab fall/winter outfit. Love this idea – just included in a recent post on my blog. Thank you for this! 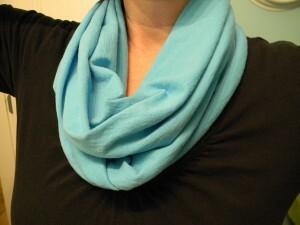 Btw, I just tried this technique with a men’s wool sweater my husband no longer liked and it worked well – an infinity scarf that’s extra warm! There are two small side seams , but they are not distracting in the scarf. Now I’m on the hunt to find a thrifted large cashmere sweater . . .that would be a great one. Okay, I’m trying to envision this: It’s already around your neck, so how can you put your head through the loop? Do you maybe mean to put your HAND through the loop? Okay, maybe you mean to pull that loop (that’s in your left hand) over your head? That’s GOT to be it! My opinion, that’s the loveliest one of all! I absolutely love how this turned out! I used one of my boyfriend’s old shirts and I’m so happy with how it looks… It’s so simple but sophisticated. Thank you so much! LOVE the idea but I have never seen a t-shirt without side seams. All of mine, all of my husbands have seams. I just wanted to say. ..you’re a genius! 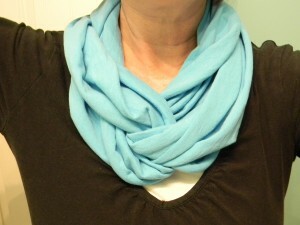 I just made this scarf tonight- I ended up using two tee shirts and sewed them together, so it’s reversible! Love. I tried and tried to figure out your directions for the final way to wear it, but couldn’t figure it out. 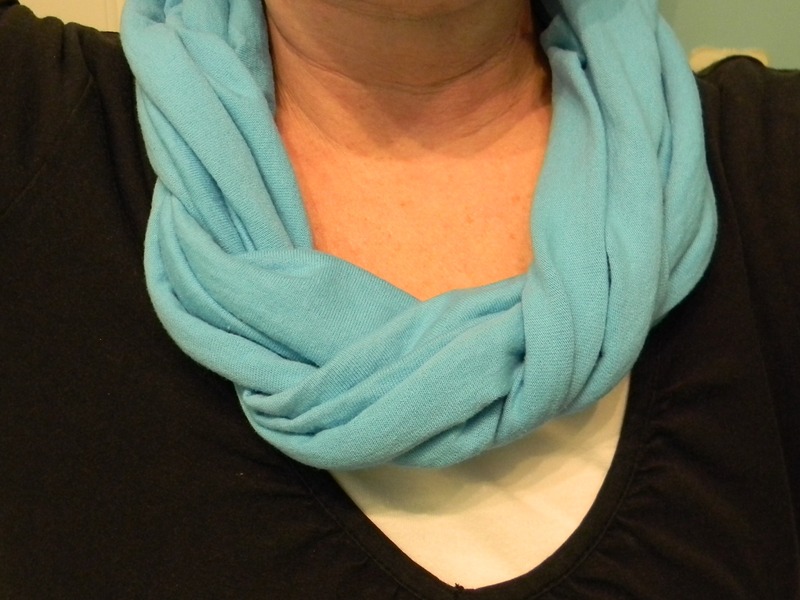 I ended up putting the scarf on (one long loop) twisting it two times and then putting it over my head a second time. It came out looking pretty much like yours in the picture, but my technique was totally different. Anyway- thanks for the tutorial!